Update 03/01/2013: The 2.3.3 version of the Tokyo Fashion Android app is a major update! The app now fully supports both phones and tablets. We have also added the ability to set any street snaps as a wallpaper on your device! Lots of smaller improvements to the code, Favorites feature, and image quality as well. Please upgrade your app and leave us a review on the Android Market! The Android app is still free, so please Download it now! Update 01/16/2013: The 2.6 version of the Tokyo Fashion iPhone app is out! The new version adds full-screen support to iPhone 5 users as well as fixing several minor bugs. We are preparing for the next version of the Tokyo Fashion iOS app – which will be universal, with full support for tablets. The iPhone app is free, so please Download it now! 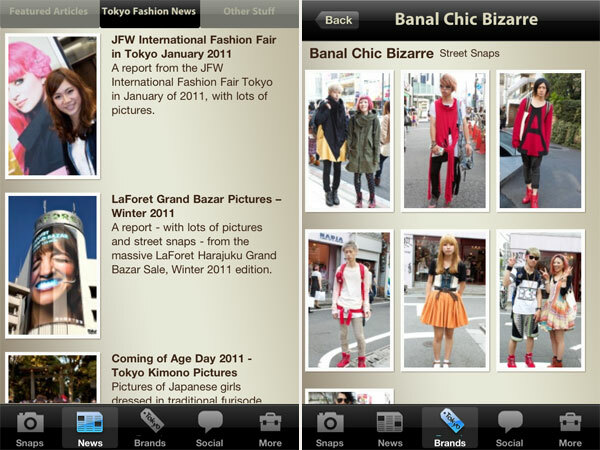 Update 11/01/2011: The 2.0 version of the Tokyo Fashion Android app is finally out! This is a massive new release with an almost full re-write of the code for speed and stability, plus lots of new features. Android users can now read and post comments on all Snaps/Articles, you can now Search inside the app, FB & Twitter have been added, you can refresh all section using the Android “Menu” button, snaps are now full-screen, and more. Please upgrade your app and leave us a review on the Android Market! The Android app is still free, so please Download it now! Update 10/22/2011: The 2.2 version of the Tokyo Fashion iPhone app is out! This release just updates the app to improve performance and fix bugs for people using the new iOS5 upgrade from Apple. The app is free, so please Download it now! Update 08/02/2011: The 2.1 version of the Tokyo Fashion iPhone app is out! Download it now to check out all of the new features – Make & read comments, share on Facebook & Twitter, Search for snaps and news, pull down to refresh, and lots more! And, it’s still free, of course! 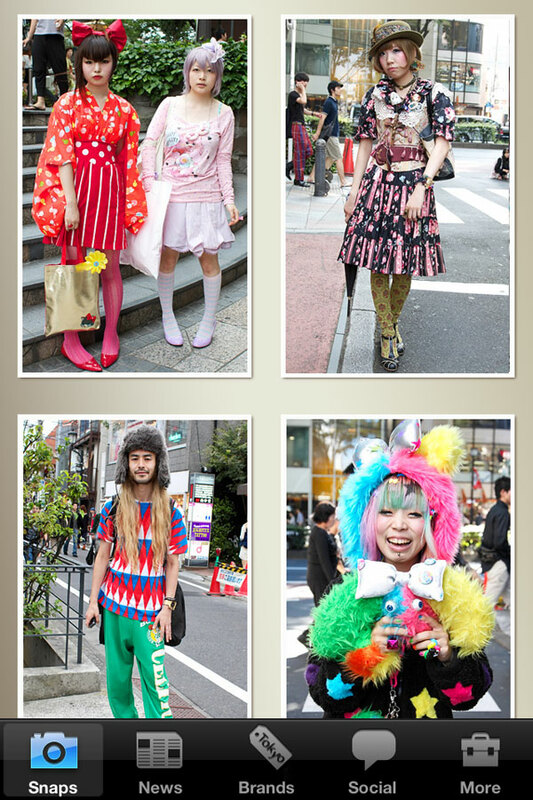 Update 06/01/2011: New version of the TokyoFashion Android App is out! Android users now have access to hi-res zoomable snaps, full snap sets, brand info on snaps, and more! This puts the Android app in sync with the iPhone app. You can download the new version for free in the Google Android Market now! Update 04/16/2011: The new (1.1) version of the Tokyo Fashion iPhone app is ready for download! Now you can zoom in on street snaps, see all street snaps in every set, get brand info, and more – check it out! Update 03/2011: Apple selected the free Tokyo Fashion iPhone app as one of their “New & Noteworthy” fashion apps! If you love Japanese fashion, what could be better than TokyoFashion.com on your home computer? How about a tiny version of TokyoFashion you can carry with you on your Apple iPhone? That’s right, we are proud to announce the launch of our very own iPhone app. The “Tokyo Fashion” iPhone app gives you quick access to each day’s main street fashion snap, the latest fashion news and feature articles, brand data, up-to-the-minute Flickr, Twitter, and Facebook posts about Japanese fashion, and more! And the best part? It’s totally absolutely and undeniably 100% free! Once you’ve installed the Tokyo Fashion iPhone app, it’s very simple to use. We’ll give you a quick virtual tour right now! You can ask any questions or report any issues by leaving comments at the bottom of this article. You can also post questions or suggestions on the official Tokyo Fashion Facebook Page. So, please launch the app! Once it’s launched, it will take a few seconds to load the latest street snaps. While the new snaps are loading, you’ll be shown a pretty slide show of previous/older snaps. It’s better than looking at some boring old splash screen or logo, right? Once the app is done loading snaps, you’ll some text that says something like “Touch The Screen To See Today’s Snaps”. As you have likely guessed, you should definitely touch the screen at this point! Here we are, at the Snaps screen. This shows you the very latest snaps that have been posted to the site. In the first version of the app, there isn’t any brand data on the snaps, but we’ll add that in future versions. We are still working out the best way to show you all of the extra text without making the small screen too crowded. It’s all in the plan for the future. Stay tuned! Now that you’ve looked at all of the recent snaps, please check out the other parts of the app. There’s a section with the latest news and features from the world of Japanese fashion, as you can see on the left. On the right is one of the screens from the Brands section. You can browse the most popular fashion brands we’ve been seeing on the streets of Tokyo, then click any of those brands to see the latest snaps and news articles related to them. Once you’ve had enough Snaps, News, and Brands, you can move on to the Social section of the app. Here, you can check our latest updates to Flickr, Facebook, and Twitter. In the future we plan to add video from YouTube here as well. Video? Yes, it’s in the works! Don’t tell anyone, though – it’s a secret. :-) On the right you can see a preview of the More section of the app. What’s here? Well, anything that didn’t fit elsewhere, to be honest. We plan to eventually expand this section greatly to add things like Search, Maps, and everything else that readers suggest! So, if you haven’t done it yet, please Download The Tokyo Fashion iPhone App and give it a try. Once you’ve had a chance to check it out, please post any questions or issues you find. Also, let us know what features or changes you’d like to see in future versions of the Tokyo Fashion iPhone app. Thank you! yaaaaay thats great..but is it only for iPhone 4??? OMG, it would be amazing if sometime, an Android version come out!, I would definitely buy it! Can you include the brand Jesus Diamanté? P.s. Love this app! When does the next Android version arrive? Why is there no blackberry version? can’t enter the app for android ver, “error downloading” appear when I open the app…. Thanks for the report, PO. We found the problem and fixed it! The Android App should be working fine again now. Please let us know if you have any other problems! Please add a favorites folder for the snap gallery! This will make it so much easier to find photos since there are so many to go through! Have you ever considered allowing for app users to save the streetstyle pics to their phones? I would love to be able to keep track of my favorite photos! fantastic app but it keeps false closing on my wildfire. please fix this. I wish it was possible to go right back into photos. Can only go back so far, and therefore unable to add certain snaps to my favourites. Some sort of search function would be tops too :) I understand these things cost money, I’d pay for an app that had these features . Whenever I click on a picture in the articles section, the picture stays on the screen and nothing else can load. So I have to uninstall and then install the app again, to be able to use the android app. I would really like to be able to view pictures when I click on them. =( I’m using an Asus Transformer tablet. Where’s the one for Android? I love the app but I really enjoy reading the story about the people in the street snaps and you can’t view that on the app. How can I save picture? Is there an update for ios6 on an iPhone 4 available? How Do I Use The Favorites Feature with The Android App? Will th iOS version be made into a universal app? I wasn’t able to delete one of comments or my name off a picture is it possible for someone who owns this app to delete it for me? @Y – if you want your name removed from a comment(? ), sure we can do that, but we’d have to know which comment to delete? Problem: pictures are blurry, in REALLY bad quality, i can’t really see anything.. Didn’t have that in the previous version (now i have the newest version, on android). I tried to re-install the app, didn’t help :-( Thank you for any advice! Hi, it says the app is no longer available on the iPhone store… Any ideas?! Sorry about that, it was a problem in certain countries and it should be resolved now! Does anyone know what cameras are used to take the snaps? I love the quality! @Pashon – Most of the snaps are taken with a 5DM3 & Canon 24-70 f2.8 or a Nikon D800 & Sigma 35mm f1.4! Thank you for the nice comment! how do you mpve pictures from the wallpaper saved into your phones gallery (android)? There are less street snaps in the iPad app than at the website. on the mobile app you should put the street snaps in order by date,month, and city like you have on the website.